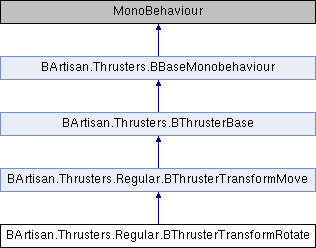 A thruster that rotates game objects using the Transform.rotate property. It does not require or use the Unity physics engine. The update is made (if the thruster works) each frame (Update), and is based on the following params: rotationPower, throttle and speedPerSecond. In which direction to rotate and how fast. Used to rotate in self space (local).